Availability: Please contact if interested in product for estimated restock date. 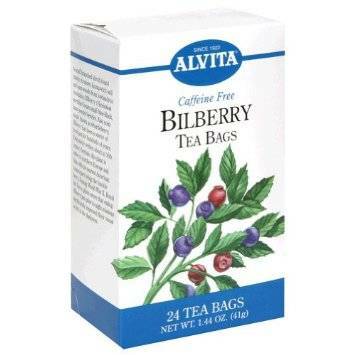 Bilberry Tea by Alvita Tea 24 Bag A small branched shrub found mainly in moors humus-rich soil and open woods from lowlands to mountains Bilberry (Vaccinum myrtillus) bears small blue-black many-seeded berries. Also commonly known as whortleberry Bilberry has been a source of fresh jam for hundreds of years. Extensively written about in 16th century herbals this berry is native to northern Europe and Asia northern Europe and Asia with its nearest American counterpart being the huckleberry. During World War 2 Royal Air Force pilots swore that eating Bilberry jam prior to night missions significantly improved their visual acuity in the darkness. Availability Remarks: Please contact if interested in product for estimated restock date.